6sqft’s series The Urban Lens invites photographers to share work exploring a theme or a place within New York City. In this installment, Riley Arthur documents NYC’s vanishing diners. Are you a photographer who’d like to see your work featured on The Urban Lens? Get in touch with us at [email protected]. “There’s no comparison to a New York diner experience,” says photographer Riley Arthur, which is what led her to start documenting all of the establishments throughout the five boroughs. Though she recently moved from Astoria to Florida, over the past two-and-a-half years she’s photographed roughly 215 diners (“I’ve lost count,” she says), usually hitting 10-12 a day and ordering a matzo ball soup at each! 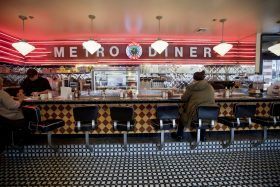 Since she began, at least a dozen diners have closed, usually due to rising rents, but Riley still has about 60 left to photograph. She shares her journey on the popular Instagram account Diners of NYC, where you’ll see everything from the faux-stone and shiny metal facades to the greasy bacon and eggs to the massive plastic menus to the neon signs and leather banquettes. Riley shared a set of her snapshots with 6sqft and filled us in on her process and favorite spots.